Christa Archuleta sorts donated items at Deseret Industries on Wednesday, March 27, 2019, in Provo. 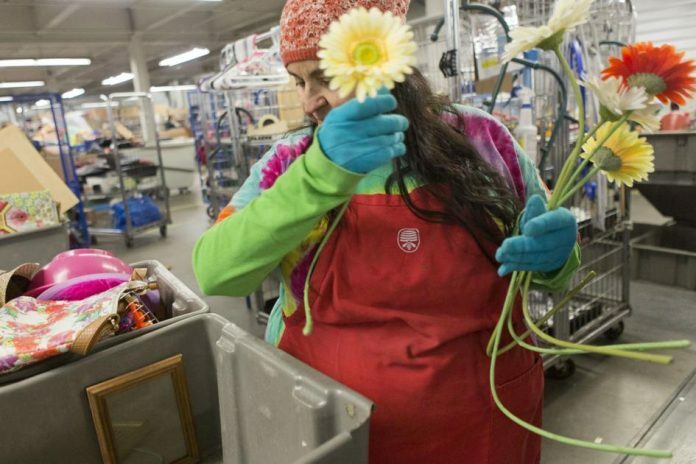 The Deseret Industries is a nonprofit run by The Church of Jesus Christ of Latter-day Saints that takes donations for thrift stores. There are three locations in Utah County. Savers employees Elizabeth Walton and Rosa Maria eat candy while dressed in hippie Halloween costumes in Orem on Thursday, Oct. 15, 2015. At the heart of Savers’ mission is a focus on nonprofits and charities throughout the world. When you donate to Savers, they donate to local nonprofits, and any items that aren’t sold are recycled or sent to developing countries. Plus, they have 99 cent T-shirts Thursday. Plato’s Closet isn’t a traditional thrift or secondhand store. Patrons bring in gently used clothes, Plato’s Closet gives them money, and those clothes are then sold at an affordable price. On average, clothes are about 70 percent off mall retail price. If you are wanting to get rid of kids items — and get paid for it — Kid to Kid is for you. Kid to Kid buys and sells name brand clothes, sports equipment and toys to save you a buck or two. Available paint at a Habitat for Humanity of Utah County ReStore. The Habitat for Humanity ReStore is a nonprofit home improvement store that sells used furniture, home accessories, building materials and appliances. The proceeds from the store are used to build homes in the local community. You can donate items including appliances, cabinets, countertops, doors, furniture, hardware, home decor, light fixtures, lumber, paint, sinks, toilets, unused flooring, windows, building materials, electrical items, plumbing items and tools. Located in Pleasant Grove, ugly’s Closet is a nonprofit, second-hand boutique that helps single mothers and families to receive clothing, household goods, education and even haircuts. It is run by the nonprofit Utah Girls Love You (UGLY). At Uptown Cheapskate, you can sell stylish clothes, shoes and accessories, and hopefully make a little money while cleaning out your closet. Get Thrifty in Provo is a thrift/consignment store with new and used merchandise including household goods, decor, kitchen items, dishes, clothes, hats, shoes, scrapbook items, DVDs and CDs. The store will also buy items if you have collections you are looking to unload.